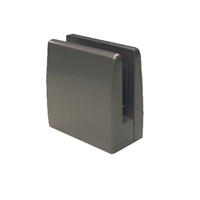 Glass panel clamps are usually used in frameless glass installations in office and work areas. Most glass clamps can be used to mount on a tubing frame or surface and securely hold a safety glass panel. We offer surface mount glass clamps for flat surface mounts. Specifically designed for 1/4-inch (6mm) glass, our clamps can be used with other types of panels that have the same width. Metal cast and approximately 2x2 inches in width and length, they can be used to create a strong and reliable glass construction. The two-part design of the clamp entails a straightforward installation process, and mounting foam pads provide additional stability. No matter if you plan to create a custom glass panel booth for your next trade show, reorganize your retail space or set up an office screen, you can depend on these glass clamps to do the job right. Silver and medium-tone finish options are available. Glass Clamp for use on top of Flat Surface.Designed for mounting 1/4" or 6mm glass, plexiglass or similar rigid product to provide a visual screen system.